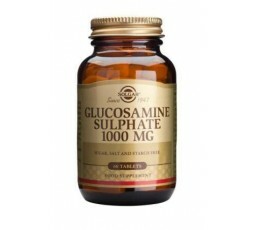 Glucosamine Sulphate 1000mg Tablets provides raw material for the production of structural components of cartilage. Solgar's Glucosamine Sulphate tablets are ideal for those people looking for a top quality supplement that provides good results. Commonly derived from crab shell, glucosamine is made up of glucose, a sugar that the body burns for fuel, and glutamine (an amino acid). It is an important part of the mucopolysaccharides, which provide structure to the bone, cartilage, skin, nails, hair and other body tissues. Glucosamine is utilised by the joints to repair, strengthen and improve the integrity of the cartilage, in addition to improving the viscosity of the lubricating (synovial) fluid in the joints. 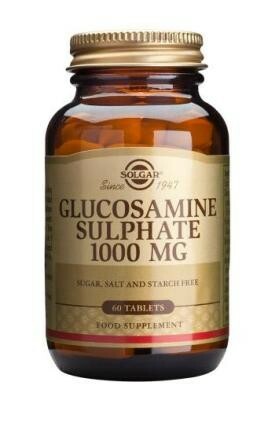 Glucosamine also relieves osteoarthritis and initiates joint repair, including reduction of pain and inflammation. Over the long term, studies suggest that glucosamine may be more effective than non-steroidal anti-inflammatory drugs (eg. ibuprofen), with none of the drugs' common side-effects. For even better results, take alongside Devil's Claw, the natural, herbal anti-inflammatory. SUGGESTED USE: As a food supplement for adults, one (1) to two (2) tablets daily, preferably at mealtime, or as directed by a healthcare practitioner. Do not exceed directions for use. Although interactions are rare, diabetics should be monitored if they intend to use glucosamine.